Every organisation that processes EU consumer data has to comply with the new EU Data Protection Regulation by spring 2018. If not organisations can face fines of up to €20 million or 4% of their global annual turnover. This webinar will show you how SAS can help your organisation meet evolving data protection compliance requirements with industry-leading analytics. 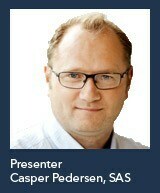 The webinar will explain how SAS solutions enable personal data identification and protection whilst ensuring the necessary agility, accessibility and flexibility for your data strategy. Please check back soon, as this webinar will become available on-demand in the coming days. This Live Webinar has now taken place. Please check this page again in the coming days, when this webcast will be available as an on-demand webinar.